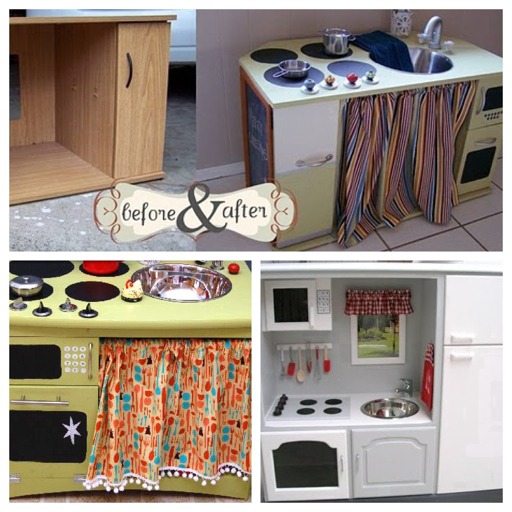 All that talk about kitchens yesterday got me doing some online research about how to make a play kitchen for Isabel. There are some great tutorials out there and I totally feel confident I could make one of these (maybe with a little help from my Papa, haha). So, friends and family, will you help me collect items to use in creating this wonderful learning tool? When it is finished, I will post my own tutorial and host a kitchen party! - Old kitchen utensils and small pots. I wish I had a desk now! I'd go get to work, despite the 100+ degree temps outside! Brilliant! Totally gonna do the same (but have Jon do it) (and have to wait until it's a heck of a lot cooler). Thanks for sharing!